November 2013 won’t be remembered for much weather drama in the UK, but it will certainly be remembered for brutal and destructive weather elsewhere in the world. In particular, Typhoon Haiyan in the Philippines, which we recorded as it happened and during the aftermath here and here. 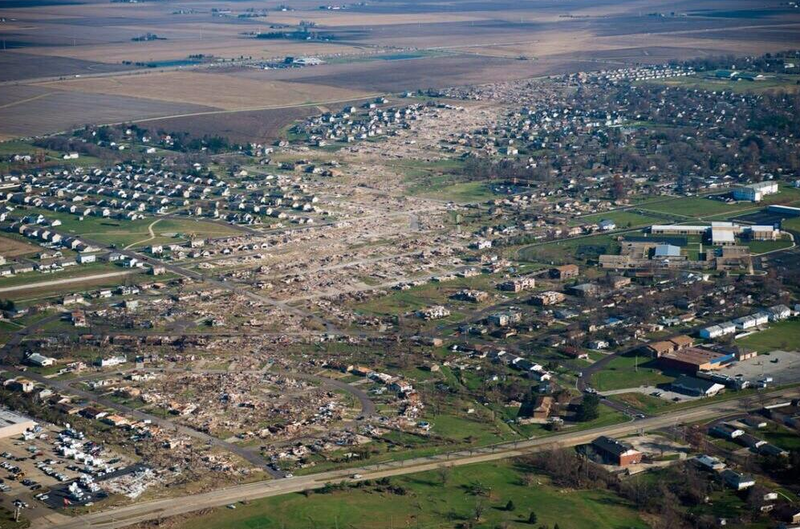 It will also be remembered for some unusually powerful late-season tornadoes in Illinois, USA (see below). For the UK, we had some autumn gales during early November mainly impacting coastal regions but, apart from these, it was a calm, relatively mild and dry month with only a few frosts in Reigate. High pressure that did emerge later in the month yielded some anticyclonic gloom for Reigate as humid air spilled in from a cool North Sea and brought low stratocumulus to create days of “dreich”: anticyclonic gloom. Here are some pics of Reigate in the good bits when the sun shone. More data below. November started unsettled with THREE “storms” (Lows) in three days which we named Mary, Mungo and Midge. They were all associated with a zonal (westerly) jetstream and each low deepened, to a greater or lesser extent on their track across the UK. Mary hardly ranked as a storm but Mungo yielded Force 10 gales in every sea around the UK. Later in the month things cooled off when the jetstream became more loopy and brought air down from a more polar direction. Average temp in Reigate for November was 9.5c, which was exactly the same as Nov 2012. Thereafter. Typhoon Haiyan in the Philippines dominated the weather headlines and was recorded in detail on our blog. There was also significant extreme weather in the USA and Canada, including tornadoes associated with severe early winter storm activity further north in Illinois, USA: a particularly powerful autumn tornado claimed lives in a town called Washington, Illinois. The track of the Washington tornado is shown graphically in the picture below. Below are two powerful videos on recent global weather extremes. First is an upsetting video of the Washington tornado hitting a house filmed as the occupants shelter for their lives, it unsurprisingly contains some bad language but is included here to illustrate the extreme impact that weather can have in the blink of an eye… and how some places a few metres away can be unscathed: this is not uncommon in many different weather hazards: surges, hurricanes, storms… discrete extremes (like sting jets) dependent on orientation, location and simply random meso-scale atmospheric chaos that cannot be predicted, can cause the most damage while other places remain unscathed relatively nearby. Tacloban in the Philippines was especially hard hit by the Typhoon Haiyan storm surge (eyewitness video below) because the bay shape acted as a funnel directing the most powerful storm surge carried by the hurricane eye. Another example of how large scale weather phenomenon impacts are highly variable according to the unique exposure of certain locations (unlucky coastline) and the vulnerability of the population to the event. Like other planetary systems, we should take care to understand the weather because it won’t necessarily take care of us.